LOLER is the abbreviation for Lifting Operations and Lifting Equipment Regulations. LOLER is the abbreviation for Lifting Operations and Lifting Equipment Regulations. These regulations place responsibilities on individuals and companies who own, operate or have control over lifting equipment, whether the equipment is actually owned by them or not. LOLER and Provision and Use of Work Equipment regulations 1998 require that all equipment used for lifting during work activities is appropriate and fit for purpose and that all lifting operations must be properly planned by a competent person under appropriate supervision. They must always be carried out in a safe manner. Many of the regulations relating to machinery we have already covered in our PUWER video course. Risks must be managed and controlled to avoid any injury or damage. This can be done by planning the lift properly, ensuring that the people who are using the lifting equipment are competent, supervised and trained. When risk assessing is involved in using lifting equipment and meeting the requirements of LOLER you need to consider the type of load being lifted, its weight shape and what it is. You also need to assess the risk of a load falling and striking a person or object and the consequences of the lifting equipment failing or falling over when in use. Ergonomic risks should be considered. This takes into account the size and shape of a human body to ensure that operating positions, working heights and reach can be adapted to accommodate the intended operator. No undue force, stretching or reaching should be required. All new lifting equipment whether manual or motorised lifting equipment needs to satisfy certain essential health and safety requirements as set by the Article 100a Product Safety Directives. Existing equipment does not necessarily have to meet the same level of protection but this does depend on the degree of risk. The greater the risk is the greater the measures you need to take to control the risk. LOLER applies to many different types of lifting equipment from vehicle inspection hoists, a passenger lift in an office block, automated storage and retrieval systems, vehicle tail lifts or bath hoists used for lifting residents into a bath in a nursing home. All lifting equipment should be strong and stable enough for the intended load. It must be clearly marked to indicate its safe working load for each configuration. Accessories for lifting should be marked in such a way that it is possible to identify the characteristics necessary for their safe use. Lifting equipment designed for lifting persons must be appropriately and clearly marked to this effect and equipment that has not been designed for lifting people must clearly state this to ensure that it is not used in error. Hoist’s slings and bath hoists used to lift people, standing and raising aids, ceiling track hoists, and the slings and all other accessories attached to lifting devices should be thoroughly examined by competent people at least every six months. If a unit is moved to another location or is involved in an incident which may have caused damage then inspection is required before it is put to use. All other lifting equipment should be examined at least annually. 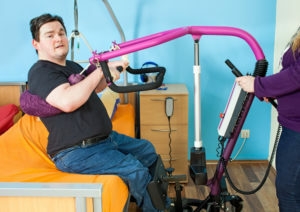 Also, the standard for Hoists for the transfer of disabled persons, BS EN10535, states that the hoist should be load-tested to its maximum load at least every 12 months. Finally, it is the employer’s responsibility to ensure that a competent person carries out the servicing. They must also keep records of the examinations and service reports for inspection by the Health and Safety Executive if an accident ever did occur.